Art object of all types, whatever be their category -stone sculptures, wooden objects, textiles, manuscripts, paintings or any other -are continuously subjected to dangers of damage and deterioration. Such object has often to be handled during transportation, exhibition, storage, photography or study by research scholars. This books, written in simple language, aims to acquaint the reader on the composition of art objects and their properties and behavior under diverse conditions so as to facilitate their care and maintenance, as also, their preservation. O.P Agrawal, founder Director of the National Research Laboratory for Conservation of Cultural Property at Lucknow, is at present Director General on INTACH Indian Council of Conservation Institutes. He has been trained in the techniques of conservation at the renowned Central Institute of Restoration, Rome. He was president of the Indian Association for the Study of Conversation of Cultural Property, vice president of the Council of International Center for Conservation, Rome and president of the Council of International Center for Conservation, Rome and President of the Museum Association of India. International organizations frequently seek his expertise and advice on matters of preservation. He has written and edited many books and article. The international award, Personality of Conservation, 1990' was conferred upon him by Brazil and in 1993 he received the ICCROM award. Museums and art collectors possess different types of art objects fabricated out of materials like stone, metal, clay, paper, textile, wood, etc. While the private collector may not need to, but museum curators by the very nature of their duties have to attend to collection of objects, their registration, cataloguing, photography, display, storing the extra in storage areas, study of objects and manuscripts, and publishing of articles or catalogues on them. One of the fundamental duties of the museum incharge or curator, therefore, is preservation. The same is true for a librarian and an art collector too. An art object, right from the time it is created, is subject to different types of deteriorating effects. Textiles, before being received for preservation, may have been worn, used and washed hundreds of times. The strength of the fabric may be already weak. A stone sculpture, having remained for long in a temple and on which water or milk or other liquids have been poured by the devotees, is likely to suffer some damage. A wooden artefact is often used by a purchaser for decorating his home or for daily use and then not taken due care of. Even after becoming a part of one's collection, the object can be exposed to various phenomena that cause deterioration, like climate, light, insects and fungus apart from physical damage. The art collector, the museum curator and the librarian have thus got to be acquainted with the nature of factors causing damage and their effects on different types of materials of which objects are made. This book has been prepared with the aim of providing information in a simple language so that the principles of preservation can be followed for better preservation of one's cultural heritage. The need for such a book was felt for a long time. 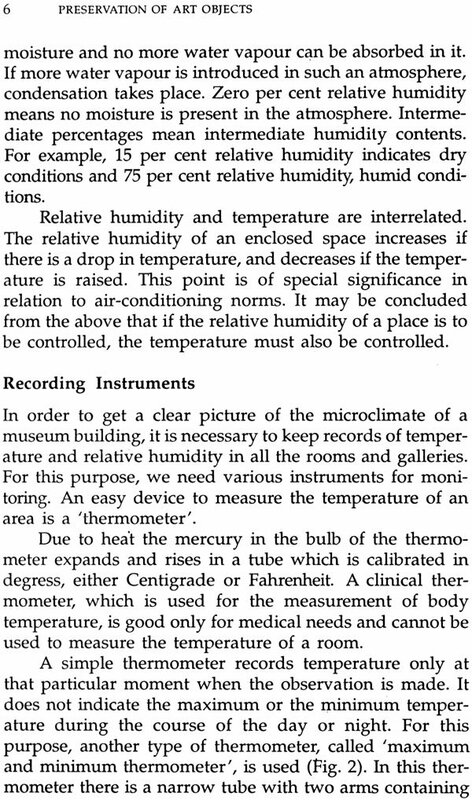 Some of the ideas contained here appeared first of all in my publication, Care and Preservaton of Museum Objects. Since then there have been rapid developments which I have tried to cover in this recent book of mine. Moreover, this book is addressed not only to curators but to the layman too. I would like to thank the National Book Trust, India for selecting this topic for its Popular Science series. I am particularly grateful to Ms Manju Gupta for going through the entire manuscript and editing it very carefully. I have received very useful suggestions from my wife Usha Agrawal, Programme Director in the INTACH Indian Conservation Institute. I am grateful to her for her advice from time to time. All the line drawings reproduced in this book have been prepared by Ms Mamta Misra to whom I am beholden. Photographs have been provided by Mr Ram Sagar Prasad; I am thankful to him for his assistance. I am very happy to express my thanks to my secretary Ms Radhamma for typing and on several occasions, retyping the manuscript. Interest in preventive conservation of art objects is grow- ing not only in museums and libraries but also among the general public. It is being gradually realised that objects can be saved from much damage by following some simple regulations. New facts of preservation have come to light since the publication of the first edition of the book in 1993. An attempt has been made to incorporate such new material at appropriate places. Nowadays control of insects without the use of chemi- cals is preferred on account of the hazard posed by such chemicals on human health. Information so far available on the subject has been added. 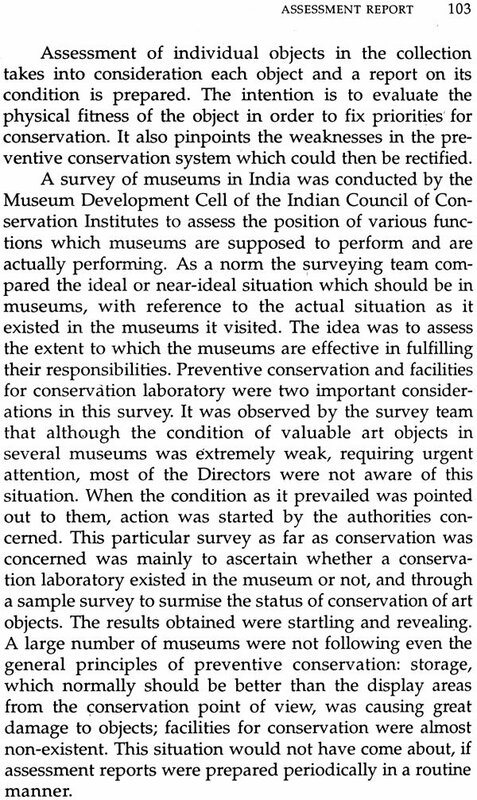 It is also being realised that periodic assessment of collections in museums and libraries, from conservation point of view, is an essential tool for preservation. A whole new. chapter on this topic has been added. We have used this technique during the last three years in many muse- ums and the results have been very satisfactory. South and Southeast Asia have an ancient tradition of arts and crafts and writings on various materials, going back to thousands of years, each era giving birth to a new form of artistic activity, and yet maintaining a continuity. No wonder we have received a rich legacy of cultural heritage in the form of stone sculptures,' metal images, wooden objects, carpets, manuscripts, books, miniature paintings, oil paintings, decorative objects of various types, glass, ceramics and articles of other materials. Various religious and places' of worship have supported, directly or indi- rectly, artistic creativity. Innumerable sculptures, images and paintings that we have today are a result of religious or ritualistic traditions of man. There would hardly be a house where, on festive occasions, an image was not created or bought or a painting was not done for worship. With regional variations in the lifestyle of the people due to the existence of different tribes and communities, there was bound to be a proliferation of art and craft objects. These art creations of the past are kept in institutions, like museums, . libraries and archives as well as in private collec- tions. In India alone, there are more than 400 museums, each having collections of different types of art, archaeological, ethnological, historical and craft objects. Because of the greater awareness for traditional values and culture, the 'number of museums is increasing and that too of libraries, many of which house not only books but also rare manu- scripts, paintings, sculptures and other forms of arts. Collec- tions also exist with private art connoisseurs and collectors. These art creations are important because they impart the message of each period of civilisation and history. Their value lies not only in their aesthetic appeal, but the role they play in furthering human knowledge is unsurpassed. Objects of daily use, utensils and tools used in the past by the common man, his paintings and decorations, provide the material for studying human development. Collections of folk art, ethnographical objects, tribal objects-docu- ments of human history-are worth preserving. Contem- porary art objects and specimens of recent past tell us something on human development. Custodians of this precious evidence of human devel- opment through the ages have the responsibility of their care and preservation. In the case of museums, the cura- tors store, display, document and interpret them. In a library, it is the librarian who acquires the books, cata- logues them, issues them to the reader and maintains them. Objects which are in private custody, although a personal property, are nevertheless symbols of human development and a national asset, and worthy of preser- vation. Quite often, despite the will to preserve and save art objects from deterioration, the necessary knowledge is lacking; it is not realised that by following simple precau- tions much can be achieved. My intention, in this book therefore, is to furnish basic and precise information on the nature of the materials used in art, archaeological, ethnological and other types of objects, the causes of their deterioration and damage, and how these causes can be controlled. It is particularly important that atten- tion is drawn to dangers, which are inherent when handling art objects, books and manuscripts and how to avoid these dangers. Gone are the days when paintings, manuscripts, and other art objects were kept in royal toshakhanas (treasuries) to betaken out only on ceremo- nial occasions. Art objects, antiques and ethnographical objects are subject to natural aging and decay. 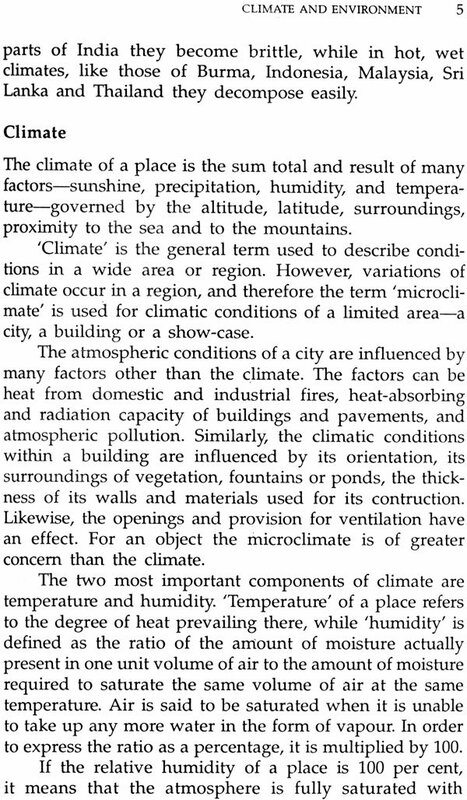 There is a continuous action of various natural deteriorating factors apart from man-made ones. Beautifully carved stone sculptures fall to pieces because of the presence of salts. 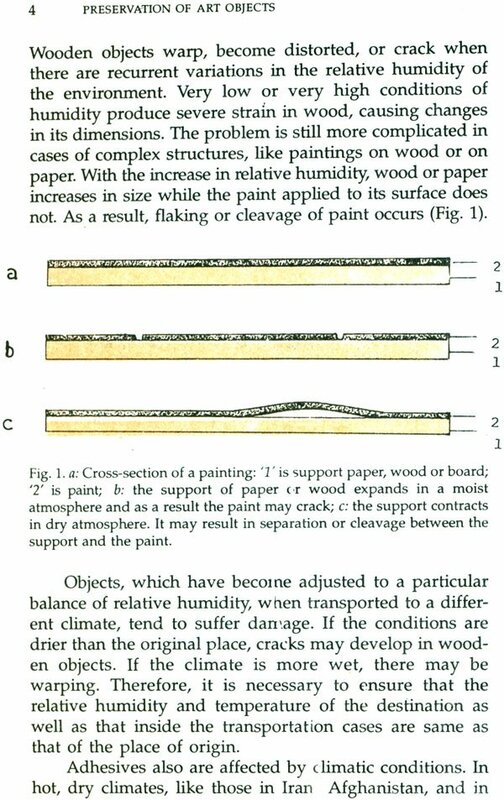 Artistic wooden images develop cracks and get damaged due to variations in atmospheric humidity. Colourful textiles fade and weaken due to action of light. Insects, like termites, can turn precious art materials into dust overnight. Fungus dam- ages all types of paper objects, textiles, paintings, and so on. Wrong or casual techniques in packing of precious art objects result in damaging them. In such cases, the ques- tion is, what can be done to avoid such destruction? Many of us think that once an object or a manuscript or a document enters the museum or a library or an archive or a collection, it is automatically preserved and the responsibility for its preservation ends there. This is not so. Steps are to be taken to ensure. that deterioration does not set in. An interesting finding of the INTACH Indian Conservation Institute, Lucknow was that most objects tended to be damaged not due to lack of air-conditioning or lack of conservation treatment but mainly because of neglect, lack of care and improper storage. In fact, conser- vation of cultural property entails remedy or treatment of defects already present in the object, and protection from further damage and maintenance of its condition through preventive conservation. To remedy the defects already present in an object and to correct the alterations it has suffered, the only safe course is to have a competent conservation laboratory examine the object, diagnose the disease, write a report and then treat it. By examination with various equipment, 'the laboratory will know the extent of damage in order to give strength to the object and to bring it to as near its original condition as possible. Here it may be noted that while in a normal conservation laboratory, advanced equip- ment is needed for analysis, like the atomic absorption spectrophotometer' or X-ray fluorescence spectrometer, in a conservation laboratory meant for giving treatment to objects the equipment required is simple though the tech- nical skill of execution is of a very high order. As opposed to conservation treatment or research, to save objects from further damage and to maintain them in good condition, certain precautions have to be observed. Apart from proper storage facilities so that physical dam- age does not take place, the custodian should know the properties of objects, their chemical behaviour and the effect of environment and other causes of deterioration. There are minor operations of cleaning and repair that the custodian can himself undertake, if he is aware of the dangers involved and takes due precautions against them. He should be aware of the various agencies of deteriora- tion, how they act upon objects, and what methods can be adopted, to control them. He should know the danger signals and how to handle works of art and store them. He should be able to apply insecticides and fungicides wher- ever necessary. Some simple remedies which can be applied as first- aid for the preservation of objects should also be known to custodians. The incharge of the collection in the library should be able to recognise where expert advice or treat- ment is called for. Let us now understand the difference between terms like 'conservation' and 'restoration'. These days the term 'con- servation', rather than 'restoration', is preferred and it has a broader meaning. 'Restoration' means any action taken in order to try to return the object, as far as possible, to its original physical and aesthetic state. It attempts to rectify the results of deterioration; it has a limited purpose and has a beginning and an end. 'Conservation', on the other hand, has much wider scope. 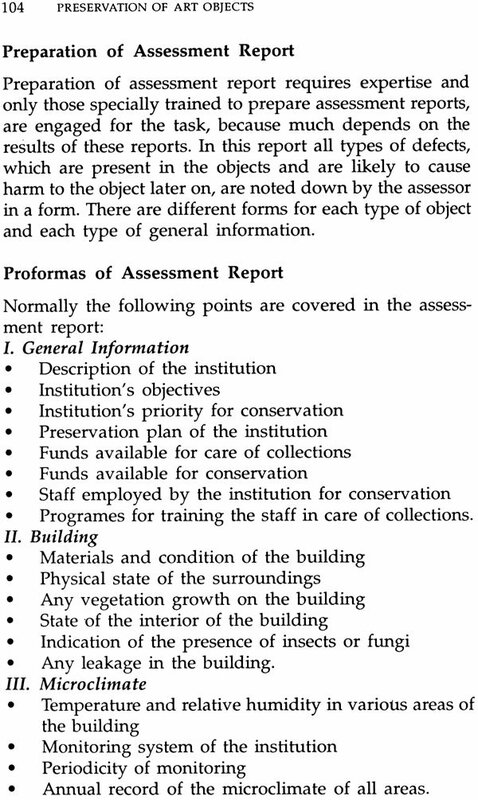 It has been defined as 'any action taken to determine the nature or properties of materials used in any kind of cultural holdings or in their housing, handling or treatment; any action taken to un- derstand and control the causes of deterioration; and any action taken to better the condition of such holdings' (Statutes of the International Institute of Conservation, London). 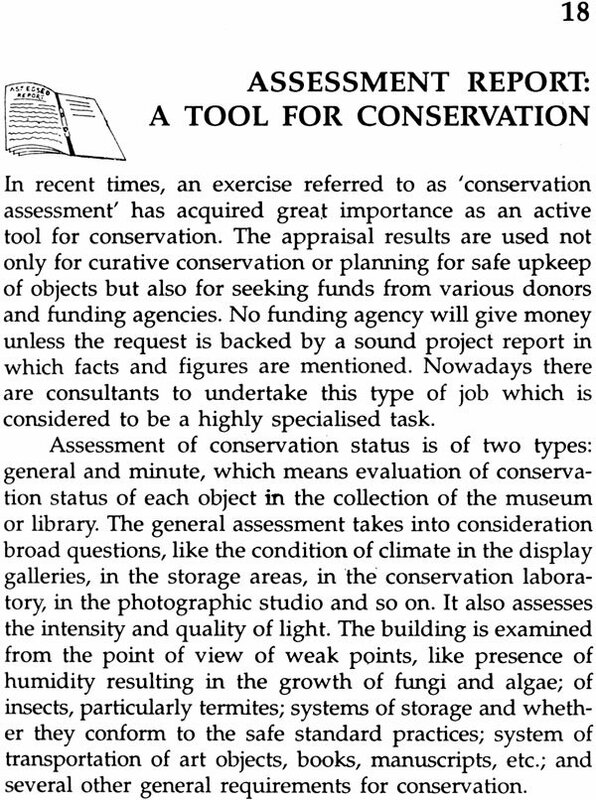 Conservation is a concept, therefore, which includes 'preventive conservation' and 'curative conserva- tion'. Preservation or preventive conservation apparently makes an attempt to maintain the object in a sound physical and chemical condition. It is, therefore, an unend- ing process. Before discussing the methods of preservation, we must first of all understand what deterioration is, and what are the various factors which damage objects. Dete- rioration is the alteration in an object produced by interac- tion between the object and factors of destruction. 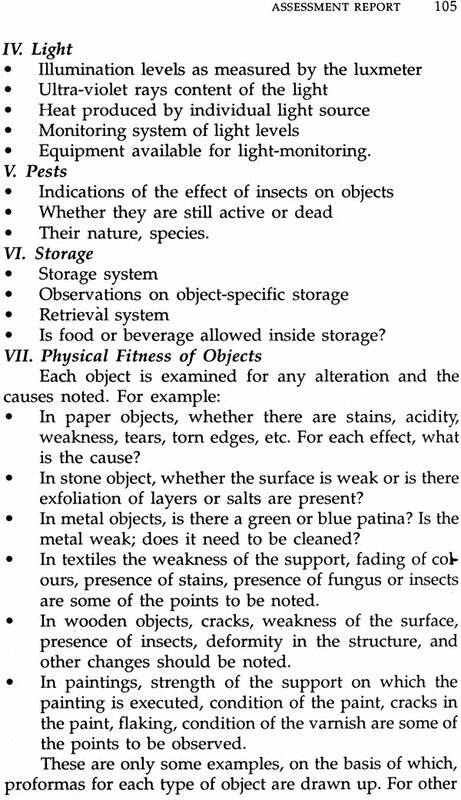 For preservation, therefore, the chemical and physical nature of the materials of which the objects are composed must be studied and the characteristics of the factors responsible for deterioration understood. All matter can be divided into two categories: (i) inorganic, and (ii) organic. Stones, metals and ceramics are of inor- ganic nature while organic materials are wood, paper, textiles, leather, ivory, bone, feathers, and other objects derived from living beings and plants. Inorganic material is less prone to natural decay than organic material and, therefore, preservation of organic objects needs greater care. 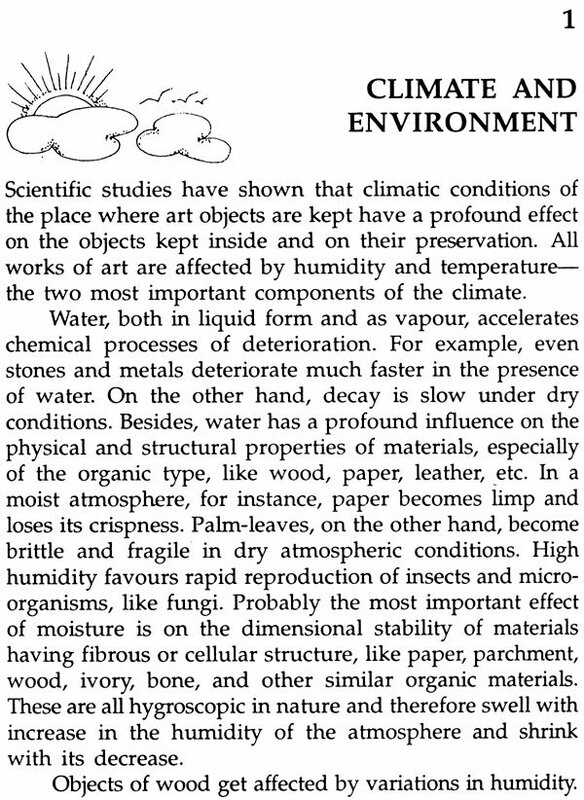 This does not mean, however, that inorganic objects are totally immune to deterioration. They also decay, but at a slower rate than objects ,of organic material. A number of factors have a destructive effect upon matter. In an open environment, direct sunlight and consequent high heat, duststorms, and other conditions of unpro- tected exposure have to be taken into account. This, however, does not mean that the objects are safe and protected inside a building. There are agents which act upon the material continuously, day in and day out, and cause it to deteriorate slowly but steadily, even indoors. Some of the causes of decay are natural and some are what might be described as man-created. The principal natural causes are climatic conditions and environment, light, micro-organisms like fungi, insects and pollutants in the atmosphere. Damages caused by man are numerous and varied: injuries to objects through mishandling, neglect, bad stor- age, accidents, or fire are among the most frequent. There are instances where stone sculptures have been br-oken during transport' because the packer did not put enough resilient packing material around them. Textiles have been tom at the creases because they were stored in folded condition. Then there are certain defects in ma terials themselves which cause continuing deterioration. Examples are the presence of salts in stone and of acidity in paper. The book has been divided into two parts to provide an easy understanding of the subject. Only when we know not only the agents that cause damage to art objects but also the nature of the materials the objects are made of that we can take the right steps for their preservation.